Whenever you take a walk through the woods, you might see lots of reptiles and amphibians enjoying a sunbath. 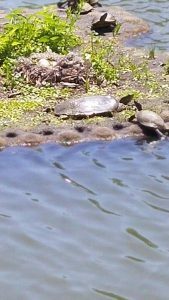 Turtles usually gather on top of a log, all lined up neatly one behind the other. Sometimes, they decide to take in the sun just off the side of a creek or river. Snakes and lizards usually like to receive the sun’s heat just off the side of a trail or on top of a log or surface. Amphibians, likewise, exhibit similar behavior. But, have you ever wondered why these particular animals do this? What reptiles and amphibians are doing is called basking. Basking is the action of receiving warmth directly from a heat source, such as the sun or a heat lamp, by simply standing or sitting under it. Both reptiles and amphibians are ectotherms, which means that they are not able to regulate their own body temperature in the same way that other vertebrates, such as mammals or birds, can. Sometimes, this is also referred to as being “cold-blooded.” Their body temperature basically depends on their environment. Basking allows these animals to be able to obtain the energy that they need in order to move about, find food, mate, and all the other things that they need to do. This is the reason why, if a reptile or amphibian gets cold, it starts acting in a very sluggish manner. Next time you visit River Legacy Living Science Center, take a close look at our pond. In it, you will find a small island in the middle that is a very popular spot for basking turtles. 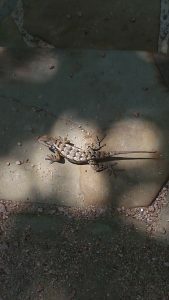 You can also search for basking lizards on any surface where the sun is hitting. ← Have you seen box turtles yet?